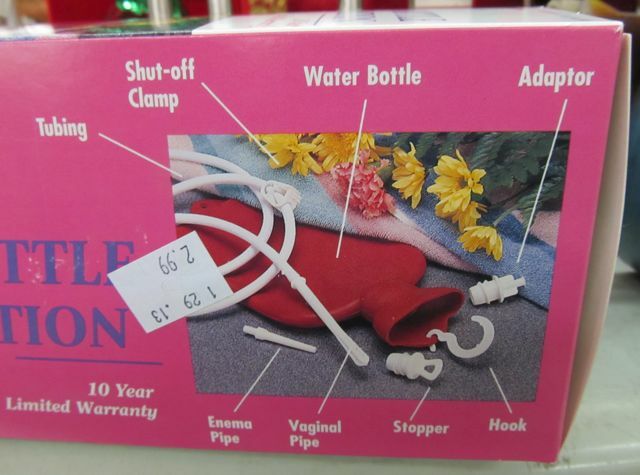 Personal Hygiene and Enema System! Available Now at Goodwill! LIKE YOU, when I’m out and about running errands and I need to feel fresh down there I head to my local Goodwill, snag an old threadbare washcloth from the linens section, wait until a homeless person is causing a scene using one of their dressing rooms as a toilet (you never have to wait long) and then take advantage of the distraction by flying through those double doors at the back and heading to the employee bathroom. There I’ll run the hot water, drop my drawers, soak the washrag and proceed with what the poor people of Puerto Rico call “taking a Slovak shower.” Ugly, ugly term. Racist! Shame on you, poor people of Puerto Rico! No wonder your filthy island paradise will never be a state. Sometimes there’s a dearth of washcloths! Sometimes there’s a cart blocking those double doors, or someone’s already in the employee restroom in the back! Sometimes a homeless man is crapping the floor in the dressing room but no one cares! Or he’s doing it so quietly and non-odorously and politely that he and his shopping cart are long gone – two, three alleys away – before anyone realizes! Then you can’t perform your mid-afternoon toilette, and pal, you’re screwed! 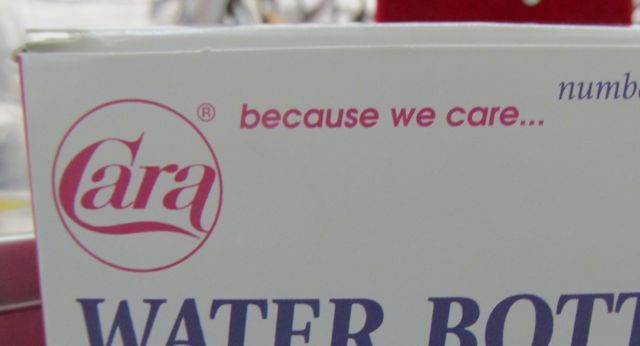 It’s the Cara Number 3 Economy Water Bottle Combination 2 Quart Personal Hygiene and Enema System! And it’s got all the bells and whistles! With this baby you can effect any necessary freshening-up in the privacy of your car’s backseat, right there in the parking lot! Just be sure you’ve brought along a thermos of piping hot water. Maybe some plastic sheeting, too, if you have fabric upholstery. Definitely if you have leather. And for God’s sake, don’t forget to feed the meter! Believe me, brother, you don’t want to be standing in the middle of a municipal parking lot wearing nothing but a long t-shirt and arguing with a meter maid with a long piece of white tubing dangling out of you, especially if you’ve neglected to engage the shut-off clamp! Then you’ll get the parking ticket and whatever citation they give street vendors for pouring unsold horchata in the gutter at the end of the day. 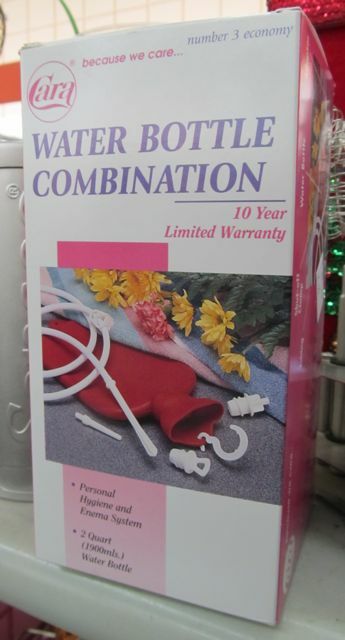 Anyway, I’m not sure how the 10 Year Limited Warranty is impacted by buying this second hand in a thrift store, but I have a feeling that the good people of Cara, Incorporated would probably work with you on that. Posted by Ted on March 16, 2013, 4:22 AM.